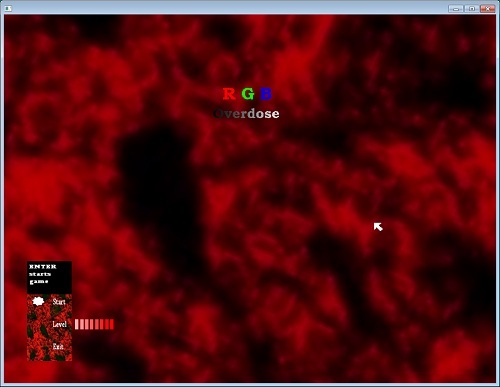 RGB Overdose was my entry at the GMD game programming competition. Game Making Deathmatch (GMD) is an annual competition (usually spanning three weeks) held by the UTGDDC (U of T Game Design and Development Club), then GPC (Game Programming Club), a university club which I helped found. (By the way, it's awesome to see that the club is still going since 2003, the year of its creation!!) My entry ranked 9th at GMD 2006. It is available for download here and is about 60Mb in size. You can also download the source code here (it is a Visual C++ 6.0 project). The game should run on Windows XP or newer. There's documentation that can be found in the doc/ directory. - 10 tracks by the band `The Prodigy`, some are mixed by other DJs. RGB Overdose is developed using Visual C 6.0. It uses opengl, and nothing else. The 'hit' check is performed at the END of the explosion animation of the shot. The game makes heavy use of randomization. It's possible to have no viruses spawn for a long time, or it's possible that they all spawn within 1-2 seconds. Though both the mentioned cases are VERY rare. Levels are Notepad-friendly and can be edited. User-created levels are also possible. The template is provided in the /levels directory. You are a surgeon, in control of an injection mechanism that will inject vitamins in a patient's open wound, attempting to destroy viruses that are looking to damage a red cell. Vitamins are of 3 kinds, Red, Green and Blue. 1. Virus A spawns and looks yellow. 3. Firing this charge will kill the virus. 1. Virus B spawns and looks yellow. 2. Virus C spawns and looks green. 3. You modify the charge to look green. 4. You fire and hit BOTH viruses B and C.
Virus C is destroyed, while virus B will become red, because all its green color was destroyed by the green charge. Each level has a stationary red cell that is pulsating. Whenever viruses collide with it, the red cell loses a hit point. On some levels the red cell is more resistant than on others. b) Berserker -- this virus is unpredictable and will bounce around, BUT will also change direction sometimes. It looks like a little spinning wheel with spikes. It also accelerates progressively. d) Terminator -- this is the most dangerous virus. 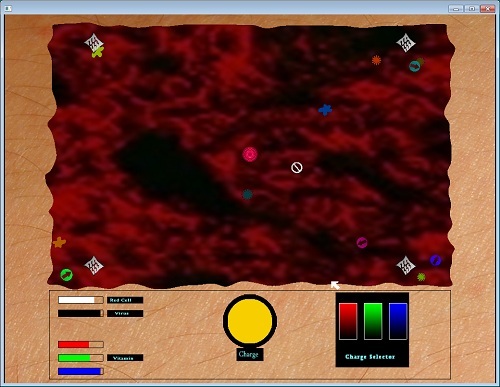 It is aware of the red cell and shortly after it is spawned, will proceed straight for the red cell. It will not stop until it reached the red cell or it is destroyed. Terminators look like skulls. Every available level is selectable from the main menu. Keep playing level 1 until you are comfortable with the controls. Many times your attention will have to shift from the targeting mechanism to the charge selector. The mouse pointer basically has no reason to ever leave the charge selector. Kill berserkers early. They accelerate. If you're finding that a virus is VERY close to dying (almost black), but you can't quite tell the colour, make your charge dark gray (low Red, low Green, low Blue, Red=Green=Blue) and spam that charge. Read the level_description.txt file. It provides VERY useful hints for each level, and it describes the intended purpose of each level. Manage your vitamins by trying to match the colors of viruses. Most of the levels don't allow you to go trigger happy. If you're finding that the virus level is way above your lowest vitamin level, you might be in big trouble. Learn to efficiently select familiar colors -- if I wanted a brightest yellow charge, I'd position my mouse cursor at the top of the RED selector, then drag it through to the top of the GREEN selector (you don't have to click, just hold the mouse button down). Likewise, if I wanted cyan, I'd drag the mouse through the tops of the GREEN and BLUE selectors. Purple is a bit harder, because you have to mouse an arc AROUND the green selector, touching only the red and blue selectors. In the same manner, you can select white, which destroys any type of virus but is very costly, by dragging the mouse over the tops of all 3 selectors. A more advanced selecting technique of color selection includes the following: -- suppose you'd like a color that's a greenish yellow -- you know that yellow is selected by dragging over the RED and GREEN selectors at the same level. But since you want it a bit greener, you can drag the mouse in a RISING DIRECTION, starting at 75% red and ending at 100% green. If you can't quite identify a color, fix two of the selector, then slowly drag mouse on the third, to see how the charge color changes. If you have a terminator headed straight for your red cell, with not much hp left, and you can't easily identify its color, perform an emergency move where you set the charge to white and fire. Do this in case of emergencies in general.